Imagine getting a 10-day luxury cruise for your birthday gift! Gail Richard, Hideaways Vice President, thought a Mediterranean cruise vacation aboard Symphony was a perfect way to celebrate her mother?s birthday together . . . and a nice excuse to check out Crystal Cruises. Accustomed to smaller cruise ships, Gail was skeptical about the accommodations, service, and privacy on a larger cruise ship. In this case, bigger is better: spacious accommodations, private verandas, a cinema, a theater (with various phenomenal nightly shows), a spa, restaurants, and shopping . . . the list of activities and amenities goes on and on. Upscale travelers will find luxury on every deck, right down to the crystal piano in the two-story atrium lobby. Discover why there are so many repeat cruisers, enjoying their 2nd, 3rd, or 27th cruise with Crystal Cruises. A new outfit wouldn't do. Neither would dinner at her favorite restaurant. Even fine jewelry wasn't good enough. You see, my mother is turning 80 this year, and I wanted to give her something truly special. So I contemplated what seemed like a thousand different choices. Then an obvious answer hit me—a trip! Of course, this couldn't be just any trip. My mother is very active, likes to be entertained—pampered, really—and she's not a beach person. She still likes to learn something new every day, and she also happens to be the world's best critic. After putting together all these criteria, suddenly the solution to this dilemma became clear. Crystal clear, actually. I decided to take my mom on a ten-day cruise from London to Amsterdam aboard Crystal Cruises'THC Symphony. I guess you could say it was the best kind of gift—one we could enjoy together and reminisce about for years to come. A new partner in The Hideaways CollectionTM, Crystal Cruises operates three ships—Harmony, Symphony, and the brand-new Serenity. Accommodating more than 900 passengers each, these ships are big by Hideaways' standards. But Crystal's "big-ship" feel is tempered by the type of "small-ship" service Hideaways' members have come to expect. They call it The Crystal Difference—clearly defined luxury that includes spaciousness (Crystal has it in spades), a high level of service, and quality touches like Wedgwood bone china tea service, Frette linens, and Brown Jordan teak deck furniture. Plus, it offers truly refined accommodations and outstanding amenities. At least, that's what I'd been told by Crystal cruisers and had read in several travel magazines, which consistently rank Crystal's ships as among the best. I couldn't wait to find out for myself. But as someone who's enjoyed small-ship cruising for years, I was also a bit skeptical. I wanted to make sure enough activities were offered to keep my mom interested and happy, but—with 940 passengers—I wondered whether there would be quiet places to relax on board (especially around the pool deck). And I wondered about the ability of the staff to maintain a high level of personalized service. I needn't have worried—in our own ways, both my mom and I couldn't have been more delighted with what we found. We boarded Symphony in Southampton, entering on Deck 5 through Crystal Plaza—her elegant, two-story atrium lobby complete with a beaded waterfall that grandly descends from the stained-glass dome above. It's quite a breathtaking entrance and an exciting precursor to what followed. Circling the perimeter are the reception, concierge, and shore excursion desks, as well as the Crystal Cove bar with its truly amazing focal point—a crystal piano. White-marble floors, seafoam-green carpeted alcoves, and pastel furnishings set the mood for our calming ocean voyage to come. Before heading to our room, we walked up a magnificent circular staircase to the top level of the atrium, also known as Tiffany Deck 6. Here we found the three shops of Symphony's Avenue of the Stars: Facets (for jewelry), Captain's Choice (logo wear, sundries), and Apropos (evening attire). Did I mention my mom loves to shop? The ship was already a hit! Deck 6 is also where Symphony's guests can find The Bistro—a comfortable espresso, cheese, and wine lounge—a cinema, a casino, the ship's computer lab, restaurants, and the spacious, circular Starlight Lounge. During our voyage, five-time international champions Tony and Margaret Long taught cruisers how to ballroom dance in the Starlight! 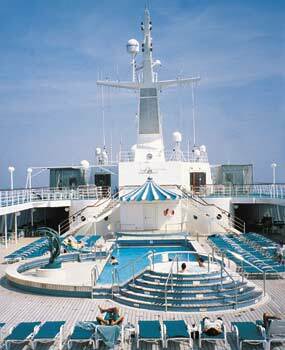 Eventually, our wanderings took us to Lido Deck 11, which is all about recreation. This deck has two rectangular swimming pools—each with its own Jacuzzi®—the Seahorse lap pool, and the Neptune Pool, an indoor/outdoor facility under a retractable glass dome. Instantly, I knew my fear about not being able to find a quiet place around the pool was unfounded. Deck 11 also has a youth activities center, complete with Fantasia children's playroom and Waves fun center/video arcade for teens. One deck up, Symphony's ocean-view spa offers exercise equipment, aerobic instruction, and specialized programs under the direction of a personal fitness trainer. The salon draws on Feng Shui designs and offers what my mother and I found to be hard-to-resist specials and mini-programs. This deck is also for sports enthusiasts, offering a Wimbledon paddle-tennis court, table tennis, golf driving nets, a putting green, shuffleboard, quoits (after they explained this was a game of ring toss, they gave lessons), and a jogging lap. Instead of waving good-bye to England, my mother and I went to our stateroom to unpack. We loved its location—tucked away at the end of the hall, just one floor above the Galaxy Theater. Forget cramped sleeping quarters—Symphony's cabins are all substantially larger than industry norms and exquisitely appointed; more than half offer private verandas. The decor of each cabin reflects the cool pastels we found throughout the entire ship, with lots of soothing colors and light woods that make the rooms seem even airier. Amenities range from plush terry robes and a TV/VCR (with videotapes available through the ship's library) to a fresh-daily custom fruit basket. The bathrooms were an especially nice surprise for two women traveling together, with twin sinks, plenty of room to spread out, and a total of 15 drawers to fill. So far, so good. My mother was happy with the shopping and entertainment options, and I was pleased with the ship's overall roominess. Our next test for Symphony came later that night—dinner. With its assigned seating, I was pretty apprehensive. Symphony is undeniably among the upper echelons of cruise ships, but would that translate into stuffy? What would our dinner partners be like? And would we enjoy sitting with the same people ten nights in a row? Our table was at the far end of Crystal Dining Room—an elegant space with intricate woodwork, mirrored ceilings, and magnificent ocean views through large picture windows. Sitting down, we met Mona and Jim from Santa Rosa, California, two of the nicest people I've ever met. Next were Helen and Bob; a bouquet of balloons floated near Bob in celebration of his 81st birthday. This couple was a ball-of-fire hailing from Long Island, New York; they soon filled us in on all the reasons they love Crystal Cruises—after all, this was their 27th time aboard! (We missed them at dinner another night, when they attended a special celebration for repeat guests; they reported that many passengers attended this dinner, including two ladies celebrating their 66th sailing). The extent of Crystal's repeat business is a true testament to its quality and another hint at the special experience my mother and I were about to have. Helen explained the ship feels like home—staff members call you by name, greet you enthusiastically, and provide a level of service that's warm and welcoming and not the least bit intimidating. By the time dinner was over, all of us were excited about what was in store for us over the next nine days! Through the years, Crystal has carefully created alliances with some of the world's top chefs and wine experts, and it certainly shows in the quality of its menus and vintage wines. In addition to the main restaurant, we also found two exquisite dining alternatives: Prego, offering delicious Italian fare with Venetian ambiance; and Jade Garden, a Wolfgang Puck-influenced dining venue featuring Asian cuisine. Between these two choices, and a few other nights when we ate poolside with the ship's band providing entertainment, I think the six of us ate as a group only four or five times. Beyond delightful tablemates and great dining choices, the food itself was wonderful—and not just the main meals. Afternoon tea in the gorgeous Palm Court was themed and was always a treat; for the Mozart Tea, staff were dressed in velvets and brocades and served us delicious Viennese pastries and cakes. For English Colonial Tea, it was scones and clotted cream. The Ice Cream bar, poolside, was one of my favorites! And the light, airy Lido Cafe and Gardens served lavish breakfast and lunch buffets that changed daily. The only dining option we weren't thrilled with was room service. While other cruise ships provide your meal on a white tablecloth and serve course by course, a staff member brought our tray . . . and left. Later, we discovered Symphony does provide this service when asked; but we think it's a special touch that should always be offered. After dinner, we were faced with the dilemma of seemingly endless choices. Watch a recently released movie in the plush theater? Do a bit of gambling in the ship's huge Caesar's Palace at Sea casino? Enjoy a little low-key entertainment in the Avenue Saloon or Crystal Cove piano bar? Or venture into the posh Connoisseur Club—Symphony's cigar lounge—for after-dinner drinks and specialty coffees? As it turned out, my mom and I never missed a night at the Galaxy Theater. This 463-seat showroom—with a revolving stage—gave us a glimpse of award-winning entertainment every night. And without any lip-syncing from the main stars! The ship's ensemble performed extravagant musicals most nights, with spectacular costumes and singing and dancing to rival that of a Broadway show. But we were in for a real treat on some of the alternating nights. Crystal invites world-class guest entertainers and variety acts aboard each of their cruises. We enjoyed the comedy of Mike Goddard, who's performed with every name in British show biz; an Evening of Fantasy by internationally renowned concert pianist Avner Arad; the fabulous voice of Jacqui Scott, an acclaimed singer, writer, and performer; and "Simply Simon," scenes from Neil Simon's comedies performed by the Repertory Theatre at Sea. During the day, we were highly impressed by the guest lecturers of "Crystal Visions," an enrichment series customized for each itinerary and designed to enhance the land portion of the cruise experience. Art historian Dr. Fred Levine discussed Vincent Van Gogh's life through his paintings, adding significantly to our visit to the Van Gogh Museum in Amsterdam. And Sotheby's Jane Gardiner discussed "The Glory of Irish Cut Glass" prior to our shore excursion to the Waterford Crystal factory. Just one day's activity list included more than I could schedule in a month: a morning walkathon, bridge lessons, Callaway golf clinic, yoga, needlepoint, fitness seminars, a fashion show, Mahjongg, a cookbook signing by Crystal's executive chefs, and so much more. There were so many interesting options, my mom and I sometimes had a hard time agreeing on what to do. Those days we'd go our separate ways for a few hours, meeting up later for ice cream or a poolside chat. She'd have her hair done . . . I'd go and play bingo (I won $51!). She'd have a Japanese Silk Booster Facial at the spa . . . I'd listen to a guest lecturer or read my e-mails (which cost a fortune!). We both played in the slots tournament together—and lost. And one day we got caught up in the excitement of an on-board art auction, where I bid on an original cartoon cell from the movie Anchors Away, signed by Gene Kelley and animators Hanna and Barbera. We had high expectations for the service and, for the most part, they were met. Many staff members knew our names within the first few days of our trip—no easy feat with so many passengers on board. To be fair, our room stewardess was quite new, so we took that into consideration when we had to ask for occasional necessities. However, if we had a request slightly out of the ordinary—like when we asked the concierge to arrange a taxi when none could be found—service was somewhat halfhearted. The friendliest staff were the lunch waiters, who committed our special orders to memory, and the casino manager, who pointed out slot machines that might be ready to pay off—and sometimes she was right! Crystal's passengers seemed a lot like Hideaways' members—sophisticated, well-traveled, and looking for all the comforts and service of an upscale resort. The average age was around 60, though I saw a number of younger couples and even a few families with toddlers. Speaking of families, children over the age of six months are welcome; Crystal's youth counselors and organized kids' activities help reinforce that feeling of family bonding. Each day, we met new people on our shore excursions. Often we'd run into them again at a show or the breakfast buffet. But the space aboard ship was generous enough for plenty of privacy, with lots of intimate little places to meet friends. Sure, there were occasional glitches in service here and there, but I've come to realize there always are; you learn to overlook those things in favor of the overall experience. In the end, my mother—remember, the world's best critic—gave Symphony two thumbs up. And the refined yet relaxed atmosphere certainly won me over. In fact, even though neither of us is celebrating a special birthday next year, we may just do a mother-daughter encore. And I hope we meet Helen and Bob—probably on their 30th Crystal cruise by then—if we do. With dozens of intriguing alternatives, it wasn't easy to choose, but the itinerary we finally selected was themed Castles & Kings, a ten-day journey from London to Amsterdam aboard the Crystal Symphony. We maximized our time in each destination by taking advantage of the shore excursions offered by Crystal Cruises. Staff members were helpful in matching day trips to the interests of each passenger: history, cathedrals, wine tours, shopping. Each excursion was rated for the level of physical exertion required. Note: Symphony has great passenger flow, with no notable bottlenecks, even when passengers are disembarking for a day trip. Very impressive! Here's an overview of the shore excursions my mother and I enjoyed. Waterford, Ireland: Our all-day excursion included a tour of Waterford Crystal, where we witnessed master artisans at work, followed by lunch at Waterford Castle; this 5-star island hotel is reached via ferry across King's Channel. We stopped in the town center on our return for a little shopping. Bordeaux, France: We had two days to explore this fabulous waterfront city and the surrounding countryside, a treasure trove of majestic estates and wine chateaux including Margaux, Mouton-Rothschild, and Haut-Brion. We visited the vineyard area and medieval city of St. Emilion (complete with moat), an underground church built between the 9th and 12th centuries, and winding streets filled with boutiques, antiques, and wine shops. The ship pier is city center, which allowed easy, independent exploration; a lively street market right on the waterfront was a highlight of our visit. The French people were very hospitable and lined up for miles to wave us off as we journeyed down the river Garonne. Honfleur, France: At the mouth of the Seine, this charming Norman fishing village was the base for departures to World War II landing beaches. Our visits to the beaches and the museum were profoundly moving; however, our stay in this artist's township was not long enough to soak up its unique character. Other options included Rouen and the Norman abbeys, or a day trip to Paris. St. Peter Port, Guernsey: This sleeper port-once home to Victor Hugo-turned out to be my favorite stop! We had just a half-day to explore this island, a mere 25 square miles in size. Our bus tour left the cobblestone streets and granite houses of the harbor to take us to the western side of the island, where we viewed the wind-swept dunes and bays of Pembroke and Grandes Rocques. We made brief stops for cream tea and scones and to visit the Little Chapel at Les Vauxbelets. Built in the 1920s from scraps of Wedgwood china and seashells, this chapel is reputed to be the smallest consecrated church in the world. Ghent/Bruges, Belgium: Our guided walking tour featured highlights of this capital city, including a visit to St. Bavo's Cathedral, which houses "The Mystic Lamb" by Jan van Eck. An enjoyable afternoon in Bruges included lunch at the renowned Huidevettershuis, a canal ride, and time for browsing a few of its many chocolate and lace shops. Of course, we also visited London and Amsterdam during our trip; they weren't really included as part of our Crystal cruise, other than as our departure and arrival cities. But we did have fun exploring these very different European cities, and you can read about our experiences, as well as the hideaways we enjoyed, in an upcoming issue of Hideaways newsletter. With so many interesting options, I'm sure I could have picked any Crystal cruise and my mother and I would have had a thoroughly enjoyable experience. Crystal Harmony: Ft. Lauderdale to Costa Rica; the Mexican Riviera; Yokohama, Japan to Vancouver, British Columbia; Hong Kong to Beijing; Alaska; Holiday Cruise: Caribbean (round-trip New Orleans). Crystal Symphony: Ft. Lauderdale to Buenos Aires; Chile to Auckland and Sydney; the Caribbean; the Baltic Sea and Russia; Canada & New England; Holiday Cruise: Caribbean (round-trip Ft. Lauderdale). Crystal Serenity: Panama Canal; Mediterranean & Western Europe; Caribbean; Holiday Cruise: Pacific Riviera (round-trip Los Angeles). Gail Richard, Hideaways' Vice President, and her mother, Anne, enjoyed their Crystal cruise this past May. Gail already wonders how she'll top this gift for her mom's 81st birthday.